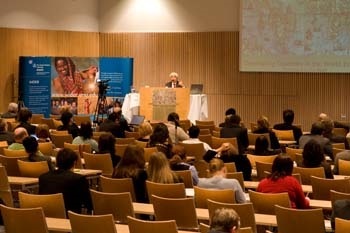 UNU-WIDER : Annual Lecture : WIDER Annual Lecture 12 - Developing Countries in the World Economy: The Future in the Past? The Future in the Past? This lecture examines recent changes in the significance of developing countries in the world economy from a longer term historical perspective. From 1820 to 1950 developing countries experienced a sharp decline in their dominant share of world GDP and a rapid divergence in their per capita income from Western Europe and North America. This widening gap persisted until the early 1970s, but then the situation changed. Rapid economic growth in the developing world over the past three decades has increased its share of international trade, industrial production, and total output. The impression of widespread development, however, is misleading, as much of the catch-up is attributable to no more than about a dozen countries. Regional differences in performance within the developing world are striking, and there is more divergence than convergence in income when compared with industrialized nations. Many poor countries and poor people continue to lag behind. Even so, the beginnings of a change in the balance of economic power in the world are visible. And the past could be a pointer to the future. 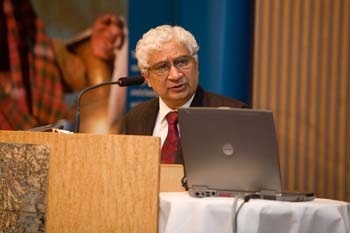 Deepak Nayyar is Professor of Economics at Jawaharlal Nehru University in New Delhi. He has taught at the University of Oxford, the University of Sussex, the Indian Institute of Management in Calcutta, and the New School for Social Research in New York. He is an Honorary Fellow of Balliol College, Oxford. He served as Chief Economic Adviser to the Government of India from 1989 to 1991, and was Vice Chancellor of the University of Delhi from 2000 to 2005. His publications include more than 50 papers in academic journals and 12 books, including Governing Globalization (2002), Stability with Growth (2006), Trade and Globalization (2008), and Liberalization and Development (2008). Selection of images from the WIDER Annual Lecture 12. Developing Countries in the World Economy: The Future in the Past? China, India, Brazil, and South Africa in the World Economy: Engines of Growth? China, India, Brazil and South Africa in the World Economy: Engines of Growth?